If the Trump administration decides to drop an appeal of a legal setback involving Obamacare subsidies, the insurance exchanges could be hobbled. Republicans have been vowing for six years now to repeal the Affordable Care Act. They have voted to do so dozens of times, despite knowing any measures would be vetoed by President Obama. But the election of Donald Trump as president means Republican lawmakers wouldn't even have to pass repeal legislation to stop the health law from functioning. Instead, President Trump could do much of it with a stroke of a pen. Trump "absolutely, through executive action, could have tremendous interference to the point of literally stopping a train on its tracks," said Sara Rosenbaum, a professor of law and health policy at George Washington University in Washington, D.C.
Trump is set to take office at a tricky time for the health law, with many Americans in both parties complaining about rising premiums and other out-of-pocket costs. The Republican-led Congress has refused to make changes to the law that would help it work better — such as offering a fix when insurers cancelled policies that individuals thought they would be able to keep. As staunch opponents of the law, they, of course, have little incentive to improve it. When problems have arisen, Obama has often used his executive authority to try to solve them. And it's this very mechanism Trump could use to undermine the law. As president, the Republican "can just reverse" Obama's actions in many cases, said Nicholas Bagley, a law professor at the University of Michigan who writes about health policy. A president "can't undo the basic architecture of the law, but you can throw sand into the gears," he said. Formal regulations would take time to undo, because they must follow a lengthy process allowing for public comment. But there are several measures Trump could take on Day One of his presidency to cripple the law's effectiveness. Perhaps Trump's easiest action — and the one that would produce the largest impact — would be to drop the administration's appeal of a lawsuit filed by Republican House members in 2014. That suit, House v. Burwell, charged that the Obama administration was unconstitutionally spending money that Congress hadn't formally appropriated, to reimburse health insurers who were providing coverage to working-poor policyholders — those earning between 100 and 250 percent of the federal poverty line. In April, Federal District Court Judge Rosemary Collyer ruled in favor of the House Republicans. "Such an appropriation cannot be inferred," she wrote of the payments, and insurer "reimbursements without an appropriation thus violates the Constitution." However, Collyer declined to enforce her decision, pending an appeal to a higher court. That appeal was filed in July and is still months away from resolution. If Trump wanted to seriously damage the ACA, he could simply order the appeal dropped, letting the lower court ruling stand, and stop reimbursing insurers who are giving deep discounts to half their customers. That move would wreak havoc, said Michael Cannon of the libertarian Cato Institute, a longtime opponent of the health law. The insurers would still have to provide the discounts, as required by law, he said, "but they're no longer getting subsidies from the federal government to cover the cost. So they are going to be selling insurance to these people way below the cost of that coverage." Even those who support the law say that mismatch would effectively shut down the health exchanges, because insurers would simply drop out. A Trump administration "really could collapse the federal exchange marketplace and the state exchanges if they end cost-sharing" payments to insurers," said Rosenbaum, who has been a strong backer of the health law. There is already some concern about the continuing viability of the exchanges after several large insurers, including Aetna and United HealthCare, announced they would be dropping out for 2017. Another way Trump could undermine the health law would be by simply not enforcing its provisions, particularly the individual mandate that requires most people to have insurance. That requirement is supposed to ensure that healthy as well as sick people sign up, thus spreading the costs of people with high bills across a larger population. But "executive branch non-enforcement could make a real difference to the vitality of the exchanges going forward," Bagley said. If healthy people don't sign up, sick people would need to pay more money for their insurance. Aside from inflicting damage to the exchanges, the administration could also affect the law's operations by refusing to approve states' changes to their Medicaid programs. States rely on federal regulators to sign off on changes large and small, including which citizens are eligible, to keep their Medicaid programs operating. "There are so many things that an administration that doesn't want a program to work can do," Rosenbaum said. The bigger question, though, is not what Trump could do to cripple the health law — it's what he would do. He has addressed the issue only rarely — characterizing the health law as, simply, "a disaster" — and his plans for it aren't clear. "It's one thing to talk about ripping insurance from 20 million people" who are newly covered, Bagley said. "It's another to actually do it." Health policy analysts on both sides of the aisle also still question where health care fits on Trump's priority list. 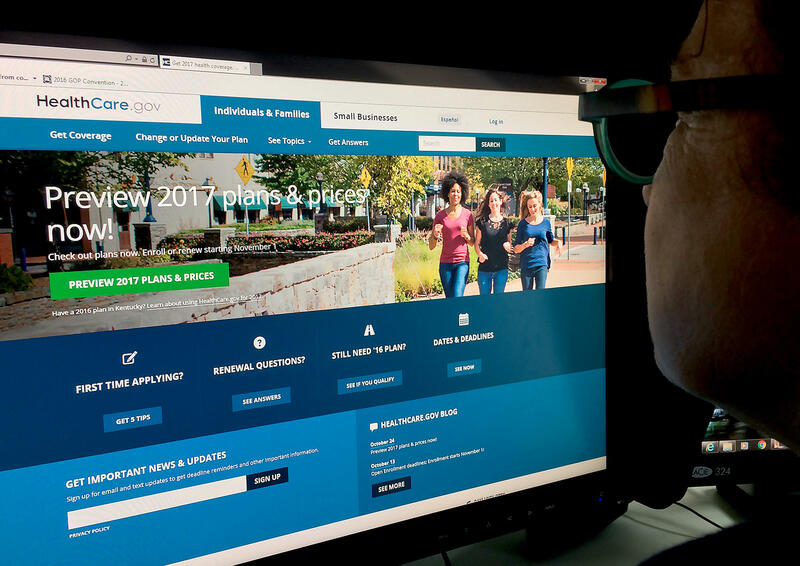 "A big unknown is how aggressive Trump would remain in going beyond rhetorically opposing Obamacare," said Thomas Miller, a resident fellow at the conservative American Enterprise Institute. "His report card as a presidential candidate reads, 'Donald needs to improve his attention, effort, and study habits. He is easily distracted and seems to prefer just picking fights with others.' "
Perhaps most important, Cato's Cannon says, is not whether Trump could single-handedly undo the health law, but whether he could undermine it enough to force Congress to take action. If Trump were to do just enough to cause the insurance exchanges to fail, he said, "that would put pressure on Congress ... to reopen the law." Editor's note: A version of this story was first published by Kaiser Health News on Oct. 7. Kaiser Health News is an editorially independent news service that is part of the nonpartisan Henry J. Kaiser Family Foundation. You can follow Julie Rovner on Twitter:@jrovner. Copyright 2016 Kaiser Health News. To see more, visit Kaiser Health News.